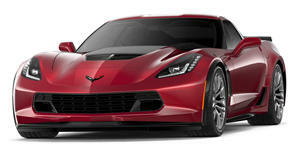 The Chevrolet Corvette has always been one of the best performance bargains in the world. For around $80,000, Chevy will sell you a 650-horsepower Corvette Z06, which can keep up with European cars costing twice as much. There is a downside, however, as Corvette interiors have always felt inferior to those of European sports cars. Corvette owners and fans will tell you it's "fine" but cheap plastic speaks for itself. If you want a Corvette but wish it had a nicer interior, an American company called Caravaggio has made a name for itself upgrading Corvettes with custom interiors. The tuning house's latest creation ups the wow factor even further with an eye-popping color scheme. This red Z06 has been equipped with bold Tension Blue leather seats while the rest of the interior is finished in Ebony black leather with red stitching. Caravaggio has also finished the back of the custom Sebring race seats with a matte carbon finish. No expense has been spared anywhere on the interior with custom leather and Alcantara floor mats, matte carbon fiber trim, unique thumb grips on the steering wheel, as well as a blue and white stripe on the wheel to match the exterior stripes. The colors used on this car are meant to (not-so-subtly) pay homage to the American flag while improving the interior to a European standard of quality. If you don't care for the bold "American flag look," you can order any color combination you like through the Caravaggio Corvettes Tailor Made Program. Caravaggio hasn't just paid attention to making the interior nicer, it has also improved styling and performance. Custom center knock-off wheels - 20-inch at the front and 21-inch at the rear - provide an aggressive stance while the red paint with blue and white stripes helps the car stand out even more. The 6.2-liter supercharged V8 has been upgraded from 650 hp to a whopping 730 hp. Caravaggio achieved this by squeezing 15% more velocity out of the supercharger with the underdrive pullys, proprietary engine management, cold air intake, and a set of stainless steel long tube headers. The cost for all of this luxury and power comes in at approximately $160,000. Caravaggio is also working on making a more luxurious ZR1, which will be released in the near future.